Columbia University’s School of Professional Studies also offers Executive Master of Science and Master of Science programs in Strategic Communication. View scenes from Strategic Communication: International Perspectives. A week-long program for seasoned corporate communication executives to learn, explore, and share leading practices to operate effectively in a global marketplace. 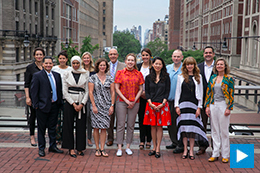 Taught by Columbia University thought leaders in the field of strategic communication, Strategic Communication: International Perspectives enables seasoned corporate communication executives to share best practices and understand the importance of operating through a strategic lens. Participants in this intensive program will learn how to respond to the challenges and opportunities presented by operating in a global marketplace, and acquire thinking habits to offer superior strategic counsel to internal and external constituents.